2016 Restaurant Food Guide is published by FUMAPEST to provide consumer links to restaurants • cafes • food safety authorities • trade associations and local online directories. Local Restaurants & Cafes • click here to apply for FREE listing in Restaurant Food Guide. Disclaimer & Feedback • details contained in Restaurant Food Guide.com.au may be inaccurate and require updating • we welcome any comments, suggestions for improvement or details of any incorrect entries • please click here to email us. Contact FUMAPEST Wollongong Pest Control 1300 241 500 for HACCP commercial pest control for restaurants and cafes in the Wollongong Council region. 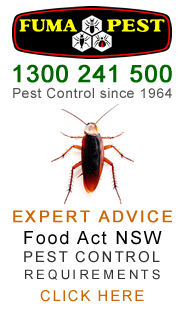 BEWARE: the most common type of non-compliance with the NSW Food Safety Regulations and easiest to prove in Court is the evidence of cockroach and rodent infestations in kitchens and pantries • feaces • carcasses • smear marks • inadequate pest control documentation. Wollongong Council Food Safety Audits • includes inspections of restaurants and cafes for compliance with Food Act NSW. Penalties for non-compliance include fines, business closure orders and or be listed on NSW Food Authority Name & Shame website. Restaurant & Catering Association 1300 722 878 serves and represents members of the restaurant and catering industry throughout NSW and ACT. RACA is a Registered Training Organisation with AQF nationally recognised certificates. Find NSW Govt DFT Licensed Home Builders in Wollongong Council region. Wollongong Council TPO Tree Preservation Orders • Wollongong Council Application Forms • Tree Removal • Tree Lopping • Tree Pruning • Stump Grinding & Removal. Find Vets • Veterinary Hospitals • Veterinary Surgeons • Veterinary Clinics in the Wollongong Council region. FUMAPEST Wollongong Pest Control 1300 241 500 for safe effective pest control of cockroaches • ants • bed bugs • fleas • rats • mice • spiders • bees • wasps • silverfish • bird proofing • termite inspection reports • termite control • termite barriers • termite baiting.